The ability to run multiple apps, folders for organizing your mobile applications, and Mail improvements lead the major changes coming in the next version of the iPhone operating system. 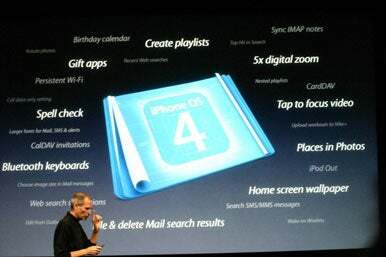 Apple gave a sneak peek Thursday at a developer preview of iPhone OS 4.0, which is coming later this summer. Unveiled during a press event at Apple’s Cupertino headquarters, the updated OS offers more than 1500 new application programming interfaces (APIs) for developers in iPhone 4.0. According to Apple CEO Steve Jobs, the new APIs let developers access features like the iPhone’s calendar, photo library, video-camera data, and more. App creators can also take advantage of OS X features like Quick Look, in-app SMS, and more. Plus, there are more 2000 APIs for hardware-accelerated math functions in the iPhone 4.0 OS. 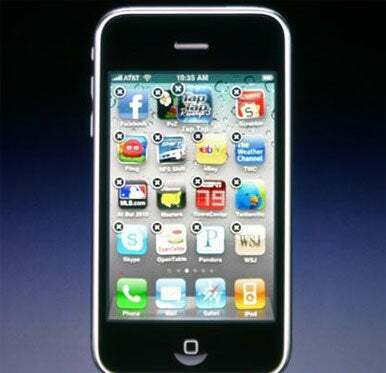 The iPhone 4.0 update will offer more than 100 new user features, Steve Jobs says. While Apple executives offered an overview of some of the changes planned for the iPhone OS, they spent most of Thursday’s presentation focusing on seven “tentpole” features that will be part of iPhone 4.0. Easily one of the most anticipated additions to the OS, multitasking will be a part of the iPhone 4.0 update. The feature is already offered on rival mobile platforms—most notably, Google’s Android OS—but Jobs believes Apple has done a better job implementing multitasking capabilities. “We weren’t the first to this party, but we’re going to be the best, just like [with] copy-and-pate,” said Jobs, alluding to the feature introduced in last year’s iPhone 3.0 update. In order to switch applications, users double-click the Home button which summons a dock-like strip showing all running applications; tap on an app to switch to it. If you’re playing a game, it will pause when you switch, and you’ll be able to resume right where you left off when you switch back. Apple contends that multitasking on most mobile devices can hamper performance of the app running in the foreground while draining battery life. “We’ve figured out how to do it and avoid those things,” Jobs said. Specifically, Apple looked at existing iPhone applications in the App Store and tried to identify what services are needed in the background, according to senior vice president of iPhone software Scott Forstall. Apple then wrote its own code to implement those services, which it has made available to third-party developers as APIs. That way, the system is responsible for maintaining battery life and performance, rather than having each additional app try and figure it out. Audio: To demonstrate the audio API, Pandora founder Tim Westergren joined Apple’s presentation to show how the streaming app used Apple’s new technology, a change that took just a few hours to implement. Just as double-tapping the Home button when the iPhone is locked currently summons the iPod controls, that same action will bring up controls for Pandora if that app is active in the background. At this point, it’s unclear if the music playback controls will be available when the iPhone is unlocked, or if Apple just expects you to switch to the relevant app to adjust playback. Voice over IP Apple showed off the Skype app taking advantage of background processes. Users can be on Skype calls and do other tasks; in fact, users can even receive Skype calls while the iPhone is locked and Skype isn’t the foreground app. When users receive a Skype call, they are alerted via a pop-up notification with a custom sound, which allows them to answer the call. The iPhone also displays a red status bar to alert the user that they are still in Skype. Apple noted that the API applies to any communications app including messenger apps and Twitter clients. Location services: You can continue to get directions from turn-by-turn GPS apps, even while performing other tasks such as listening to music in the iPod app, thanks to this API. Some apps use location information, such as Loopt, but they don’t require GPS to be always-on; instead Apple uses cell phone location information. When a user switches cell phone towers, it can indicate to the service that location has changed. To satisfy privacy concerns, Apple will add an indicator in the menu bar, next to the battery icon, to let you know if an application has requested your location any time in the past 24 hours. And preferences will allow you to disable or enable location for each app. Push notifications: The iPhone’s existing Push Notifications API, introduced in iPhone 3.0, is one available to developers that already runs in the background. Local notifications: Apple has added a new service called Local Notifications, which lets apps launch notifications without the need for an external server. Using this API, Forstall said, you can have a TV guide app alert you when a show is beginning. Task completion: This API is designed for apps that can take a while to finish certain tasks—for example, uploading photographs to Flickr. Now you can switch to other apps and let Flickr finish its business. Fast App Switching: An app will be able to dump all information related to its current state and go into a sleep-like mode where it consumes no processor power. When you switch back to the app, everything returns to exactly the point where you left it. To demonstrate, Jobs showed off a Folders feature for the iPhone’s Home screen, allowing users to group applications. When you’re editing your Home screen, you can drag one app on top of another app to automatically create a folder. The iPhone automatically names folders based on the categories of the apps. So, for example, you can create a Games folder merely by dropping one game on top of another. The folder icon displays a small set of tiles showing you which apps are inside, and you can drag the folder anywhere on the Home screen, just like an app icon. There’s no limit to the number of the folders you can have; it’s even possible to put one in the iPhone’s Dock. The addition of folders means the iPhone can let you see more than 2000 apps at a time. Currently, the iPhone’s 11 Home screens and dock let you see only 180 apps (though in either case, you can load as many as space allows and launch them via Spotlight). In a move borrowed from the iPad, iPhone 4.0 also lets you change the background wallpaper on your iPhone’s Home screen—this can either be the same as the lock screen’s wallpaper or an entirely different image. Apple has overhauled the Mail application for iPhone 4.0, adding support for a number of features, including a unified inbox that allows you to see all incoming mail from multiple accounts. You can also quickly jump between inboxes for multiple accounts. In addition, Mail also now supports more than one Exchange account at a time, and you can also organize by thread. Attachments are enhanced as well: you can now tap files attached to e-mail messages to open them in a separate application, including third-party apps. In another borrowed feature from the iPad, Apple will make its iBooks e-reader available to the iPhone in iPhone OS 4.0. The iPhone offering will be a smaller version of the iPad app, but it allows for the same features, including purchasing from Apple’s iBookstore. And you’ll also be able to sync your place and bookmarks between multiple devices—leave off reading a book on your iPad, and you can start reading it in the same place on your iPhone. iPhone 4.0 has added new features for business users. At the top of the list is better data protection: all e-mail, including attachments, can be encrypted with your PIN code. And Apple will make encryption APIs available to third-party developers, allowing them to do the same with data stored in their apps. Apple also plans to roll out improvements for mobile device management for companies that deploy large numbers of iPhones. (Forstall noted on Thursday that more 80 percent of Fortune 100 companies use iPhones in some capacity.) Companies can now wirelessly distribute applications anywhere in the world from their own servers. In addition, there’s the aforementioned support for multiple Exchange accounts, and support for Exchange Server 2010. Plus, Apple is supporting SSL VPN for both Juniper and Cisco. Billed as a “developer preview” in iPhone OS 4, Apple announced a social-gaming network called Game Center, which seems poised to compete with services such as Xbox Live and the PlayStation Network. You’ll be able to invite friends, participate in online matchmaking, compete in leaderboards, earn achievements, and more. While available first to developers—presumably so they can integrate the functionality in their apps—Game Center will roll out to end users later this year. Updated at 11:05 PT with information on availability and compatibility. Updated at 2:05 p.m. PT with more information throughout the story.